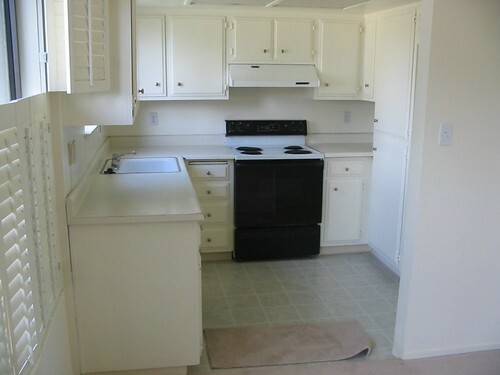 You may think that there is very little that can be done with a small kitchen. However, with a bit of imagination and being creative with the space available, it is possible to design a kitchen that may be lacking in size but more than compensates in appearance and functionality. Here are some of our small kitchen ideas that will hopefully inspire you. Make the most of as much natural light as you can. Wall colours and tones should be as light as possible. If your walls are tiled, use splashbacks made from reflective materials such as high gloss ceramics. Splashbacks can also be used for hanging larger kitchen utensils. Opt for blinds rather than curtains. Effective lighting can prevent your kitchen from feeling dark and dingy. Ceiling mounted fixtures, under cabinet lighting or recessed cans are simple and effective. Above or in cabinet lighting also creates a bright, well lit kitchen, making it appear larger than it is. Use as much of the walls as you can for extra units and storage. However, utilise cupboard doors that are glass rather than wooden fronted. Glass doors are less oppressive than solid doors as well as giving your kitchen a bright, contemporary look. Use the backs of cupboard doors as well for storage. For smaller spaces, cupboard doors on runners instead of hinges can also be less obtrusive and save space. Also consider using sliding doors to divide the kitchen off if it is small and leads onto another room. This creates a sense of separateness and encloses the space. For base units, raising them from off the floor also helps to accentuate the feeling of space. Ideally in kitchens, the main appliances – the cooker, fridge and sink – should be positioned in relation to each other in a triangle rather than in a long line. If a kitchen space is small though, then the cooker should be the focal point. This will look less incongruous than if it were to be a fridge freezer that dominated the kitchen. Do not go for patterned floors as this can make small kitchens feel ‘fussy’ or cluttered. Instead us plain tiles or a light colour. Laying wooden planks across a small area can also trick the eye into perceiving a space to be larger than it actually is. Mount hooks on the ceiling and use it for extra storage. 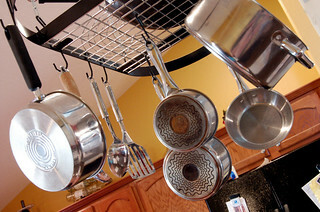 Large pans, dishes and so on can be hung up rather than taking up valuable cupboard space. Crockery can also be mounted on wall racks which again both utilises and helps to save space.